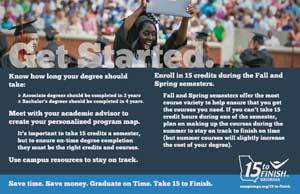 Complete College Georgia has developed these 15 to Finish postcards to support campus promotional activities. 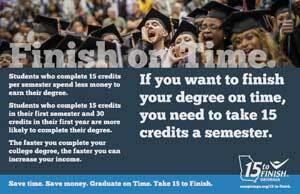 The two sided postcard provides students with the essential facts on why taking 15 credits or more a semester helps them graduate on time and saves them money. A limited quantity of the postcards are available from the University System. Please contact Jonathan Hull to request postcards for your institution. You can also print copies of this postcard by using this PDF. The document is set up to print double-sided at full size and be cut in half.